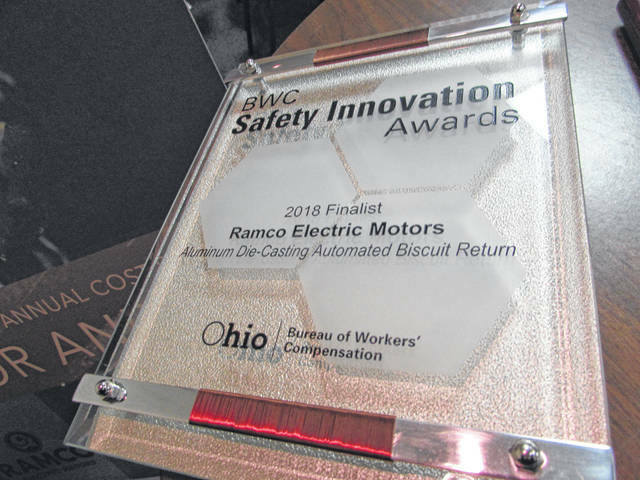 Ramco Electric Motors recently was declared a finalist for an Ohio Bureau of Workers’ Compensation Safety Innovation Award. Ramco Electric Motors recently was declared a finalist for an Ohio Bureau of Workers’ Compensation Safety Innovation Award. Ramco Electric Motors recently received Supplier Excellence Awards from Caterpillar, Inc., and aircraft manufacturing company United Technologies Corp.
GREENVILLE — Local manufacturer Ramco Electric Motors held a luncheon on Wednesday at the Greenville Elks Lodge afternoon to celebrate the company’s receipt of a trio of awards. Ramco manufactures electric motors and related components for industrial, military and aerospace applications. The company recently received Supplier Excellence Awards from Caterpillar, Inc., a construction machinery and equipment manufacturer based in Illinois, and Connecticut-based aircraft manufacturing company United Technologies Corp. Ramco also was a finalist for the Ohio Bureau of Workers’ Compensation’s Safety Innovation Award. The Safety Innovation Awards were established to recognize innovative solutions that reduce the risk of workplace injuries and illnesses, according to information on the organization’s website. 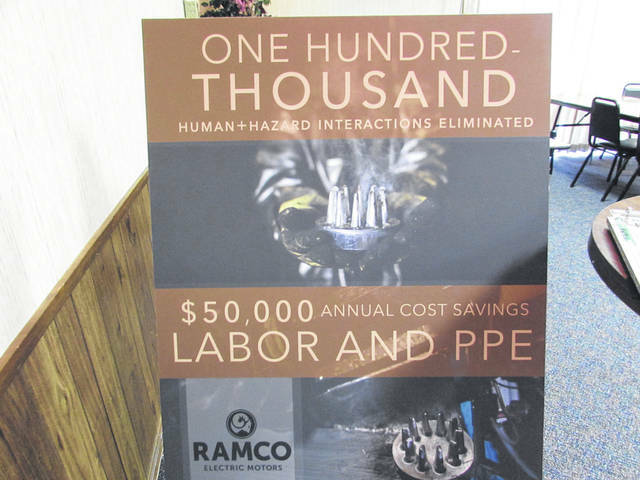 Ramco came in fourth out of 75 statewide submissions, according to Ramco Human Resources Manager Jase Barhorst. The company received an honorable mention for its automated biscuit return conveyor system, which delivers aluminum die-casting byproducts from the casting machine to a 1,300-degree liquid aluminum bath, eliminating the need for employees to be exposed to the hazardous process. 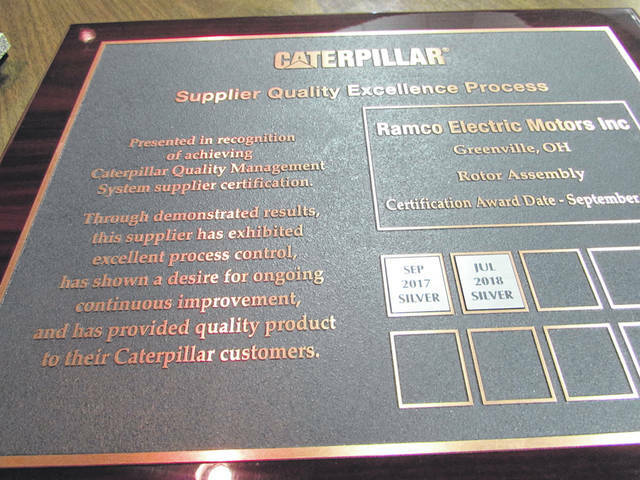 Ramco earned a silver Supplier Excellence Award from Caterpillar and a gold award from UTC. Quality Manager David Warner spoke about the awards, in particular the one from UTC. UTC supplier award winners are critical business partners that meet UTC’s expectations for business practices, environmental responsibility and operational excellence, according to the company’s website. Ramco also held its quarterly employee meeting during Wednesday’s luncheon. According to Barhorst, the company made donations to Arcanum-Butler Schools’ indoor track and field team during the previous quarter, which helped purchase new uniforms, as well as to the Ansonia Music Boosters. Dunaway also spoke about the company’s dedication to the growth of its employees. This entry was tagged Greenville, Ramco, Ramco Electric Motors. Bookmark the permalink.